Philips Radio Model 436-AN was "Made in USA"
While it is not a typical boatanchor, I was interested in this radio for its history. I bought it at a swap meet because it was the first Philips radio I had ever seen that was "Made in U.S.A." Although I am somewhat familiar with Philips radios, I was unaware that any had been made in the United States. The tubes in this set are typical American metal and GT octals of the late 1930's. Several of the tubes in the set are also labeled as "Philips" - "Made in USA". Broadcast and short wave coverage is continuous from 550 KHz to 22 MHz in 5 bands. Rear panel connections are typical European banana-jack pairs for phono input, antenna and ground, and an external speaker. A rear panel fader rheostat is included for the internal speaker so that its volume level can be adjusted relative to that of an external speaker. The speaker has a cloth bag used as a dust cover, typical of Philips sets of the era. The power transformer can be set for a variety of input voltages from 110 to 245 volts, also typical of Philips sets intended for an international market. It was set at 110 volts. I reset it to 125 volts. One knob was missing when the radio was purchased. The knobs are made of wood and contain a brass inner sleeve and set screw. In addition to the typical stations and countries normally listed on a short-wave dial for a radio made or marketed in the US, this radio also has the listings "Netherlands Indies", "Sourabaya", "Djocja", and "Batavia" which are all in Indonesia, controlled by the Dutch at the time. The Dutch shortwave stations in Hilversum / Huizen are conspicuous by their absence on the dial. The Netherlands was an occupied country a year and a half before the US entry into World War II. The shortwave transmitters in Huizen were blown up at the start of the invasion in May 1940 to avoid their falling into the hands of the Germans. Indonesia was invaded by the Japanese in March 1942. This radio was likely manufactured between those dates. I am surmising a probable date of late 1941, possibly for the 1942 model year. I have been told by Dutch sources that Philips started making radios in the USA about the time that the Germans invaded the Netherlands. Some of the leadership of Philips went to Britain and then on to the USA to escape the Nazis. Given that the radio is relatively rare, I also believe that the making of these consumer radios was halted shortly after the start-up due to the US entry into WWII and the need to shift to war materiel. If you have more accurate information, please let me know. Several U.S. Shortwave stations are listed by their call letters on the dial. Those are WLWO, (Crosley) in Mason, Ohio. WNBI ,(NBC international), in Bound Brook, New Jersey, WRUL in Boston (Scituate) Massachusetts, and KGEI at Treasure Island in San Francisco bay, California. All of these call letters were assigned by the FCC on September 1, 1939 as a change from their earlier experimental call letters (for example WNBI was W3XL). 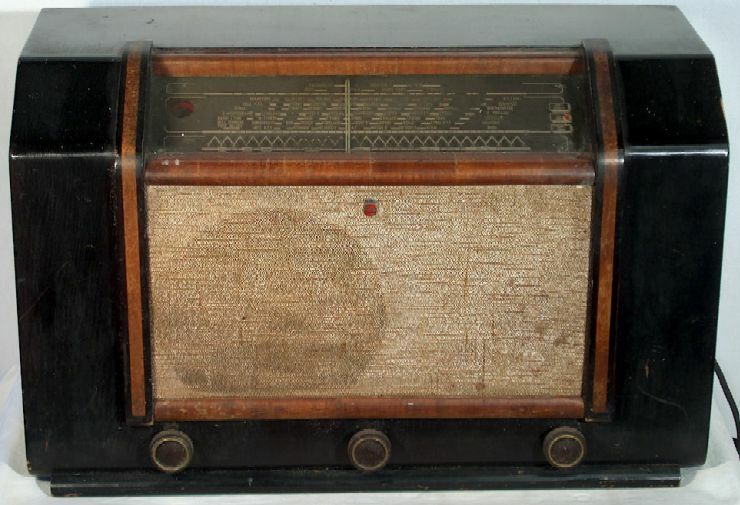 This further dates the radio design as the 1940 model year at the earliest. The volume control/ on-off switch was corrosion-welded. I removed the control, and partly disassembled it. Since it had a tap for the tone control, a replacement would not be easy to locate. I use penetrant on the shaft and the bushing and managed to loosen the corrosion with the shaft locked in a vise. The shaft was cleaning and burnished to avoid recurrence of the problem. The flaking rubber power cord was replaced with a modern polarized cord. Several capacitors were replaced including the cap to the input grid of the 6V6GT and a cap located across a tap on the output transformer. That tap carries all of the high voltage for the set in what appears to be a partial choke. Failure of that cap could take out the rather unique tropicalized output transformer. That transformer is totally coated in a potting material and mounted on a phenolic insulator with a DC bias by way of a high value resistor connected to its core.One of the variable capacitor sections shorted at certain points in its movement. I located the shorted section and was able to straighten and clean the plates causing the problem. I substituted a generic knob for one that was missing. In this radio, the tuning dial, the pointer and the band indicator stay in the cabinet when the chassis (with its variable cap tuning dial pulleys) is removed. Only a small piece of the original dial cord remained. I determined the likely path for the dial cord and used 65 pound Spider Wire (fishing line from Walmart) to replace the dial cord. Mating it with the captive dial pointer when replacing the chassis in the cabinet was easier than I had expected. However the separate dial cord that is used to turn the spring-loaded band indicator gave me some fits. That cord was still attached but has to be an exact length in order to properly indicate the band to which the radio is set. After placing the chassis back into the cabinet and working from the back, I finally managed to make a knot and loop of the right length to make the spring-loaded indicator read properly. I'm sure Philips must have had some kind of trick procedure to accomplish this, but I used trial and error. After a bit of alignment (and in the absence of a schematic or instructions for alignment, tracing the circuit to determine which adjustment did what), I was pleased with the performance of this set. Best performance is with a good external antenna. With the antenna, I was able to easily tune in my favorite distant weak-signal oldies station. The ability to pick up that station is a good indicator of both sensitivity and selectivity since it is close in frequency to a strong local broadcaster. Performance on the lower short wave bands was equally good. If you have accurate historical information on the manufacture or the market for these sets, please let me know. Where in the US was the manufacturing facility located? There is no indication on the radio that would help identify the location of the factory. What similar radios would help to date the set? The dial markings and the overall cabinet style are very similar to the Philips 789X which dates from 1940. Note the use of the unique logging scale in both sets (the continuous, "W" or triangular wave shape at the bottom of the dial). The 789X radio image is part of Wouter's Antieke Radio Site in the Netherlands. How common are these radios? This is the first I have ever seen. The model is not listed in either Rider's or Sams. Was it made in the USA for sale only to an export market outside the USA, perhaps to Indonesia? Dutch sources have indicated that the radio was tropicalized and possibly intended for tropical export destinations. The Sprayberry Academy of Radio VOM was the previous item on the bench.